A dear girlfriend and her young daughter dropped by a few days ago for a cuppa and a chat. 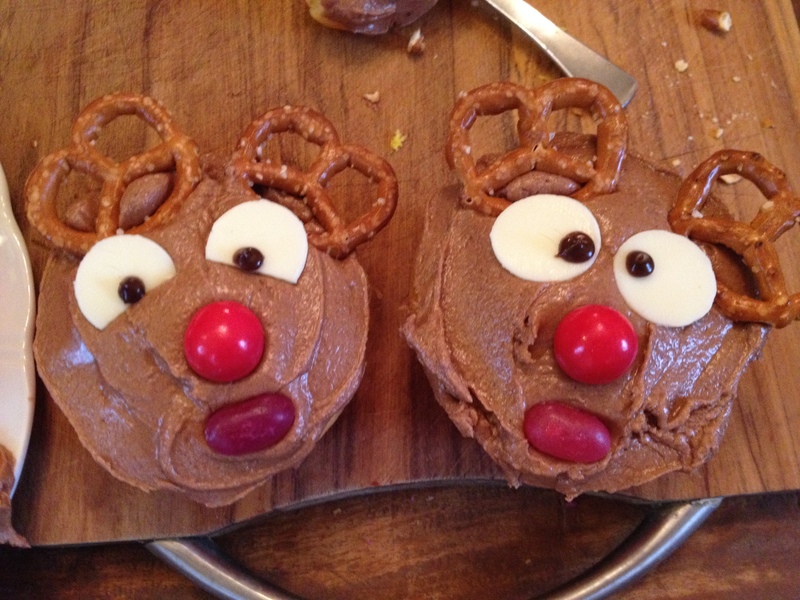 It was a perfect opportunity to try out this Christmassy recipe. The fun of this recipe isn’t just in the eating! It’s a great activity to keep the kids occupied while grown-ups chat, or for a bit of family togetherness to get you in the Christmas Spirit. You can make the cupcake batter from scratch using the recipe below, or use your favourite packet mix if that’s more convenient. You could also use ready-made icing/frosting. Make the cupcakes at least two hours in advance so that they are cool before you ice them. Ingredients: 1/2 cup (125g) softened butter, 1 tsp vanilla essence, 3/4 cup caster sugar, 2 eggs, 1 and 1/2 cups sifted Self Raising Flour (self-rising for my USA friends or for every cup use 1 cup of all-purpose flour, 1 and 1/2 x teaspoons baking powder and a pinch of salt, sifted together), 1/2 cup milk, *Optional – 1/2 cup of small candy-coated chocolate sprinkles or mini M and M’s. Preheat oven to moderate (160 degree celcius fan-forced or 180 degree oven – 350 degrees fahrenheit). Place paper cupcake liners into a 12 hole capacity muffin/cupcake tin. Cream butter, vanilla and sugar in small bowl using an electric mixer until light and fluffy. Add eggs one at a time, beating well until combined. Stir in half the sifted flour and half the milk, then stir in remaining flour and milk. 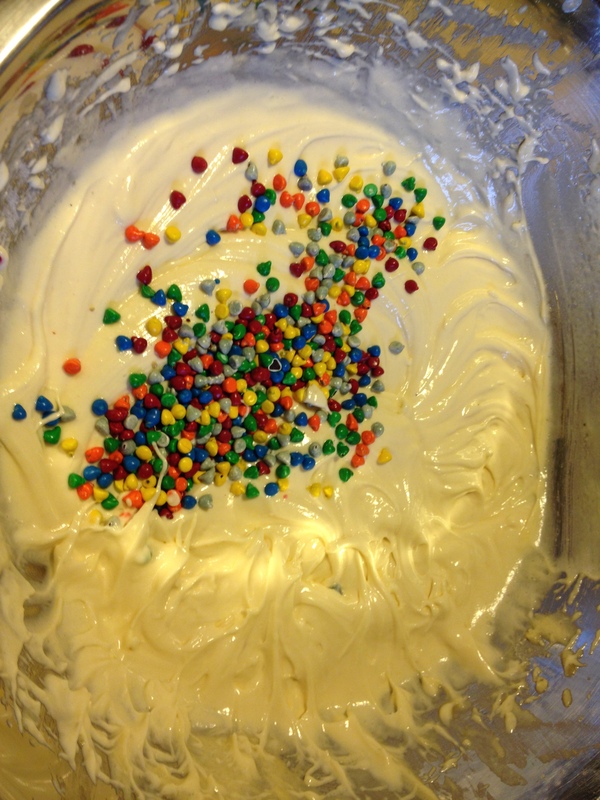 If you’re using the sprinkles add them in now for a fun surprise in your cooked cupcakes. Fold through gently. 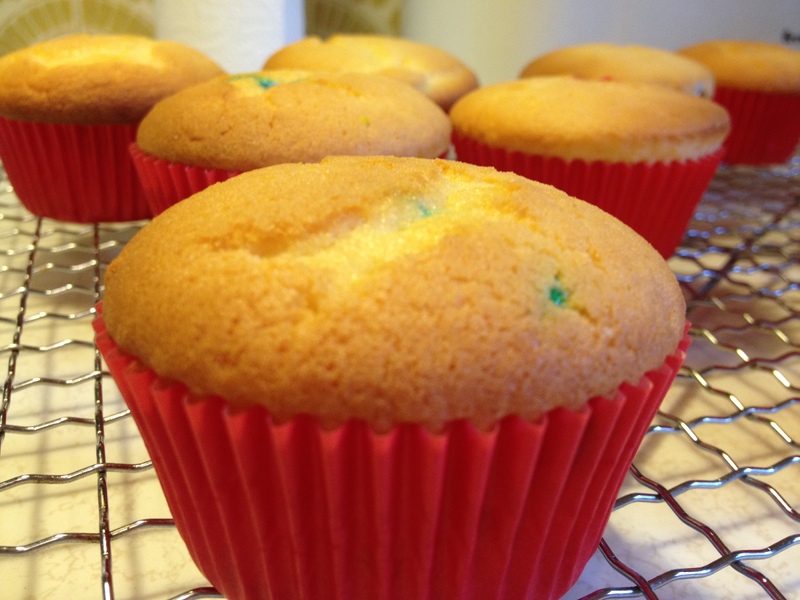 After the cupcakes have baked, when you break them open they will be brightly flecked with colour! Bake for 15 minutes in a moderate oven. Cakes should spring back when pressed lightly in the centre. If not quite done cook a minute or two more. Remove from oven and leave in tray five minutes and then remove and cool on wire rack. 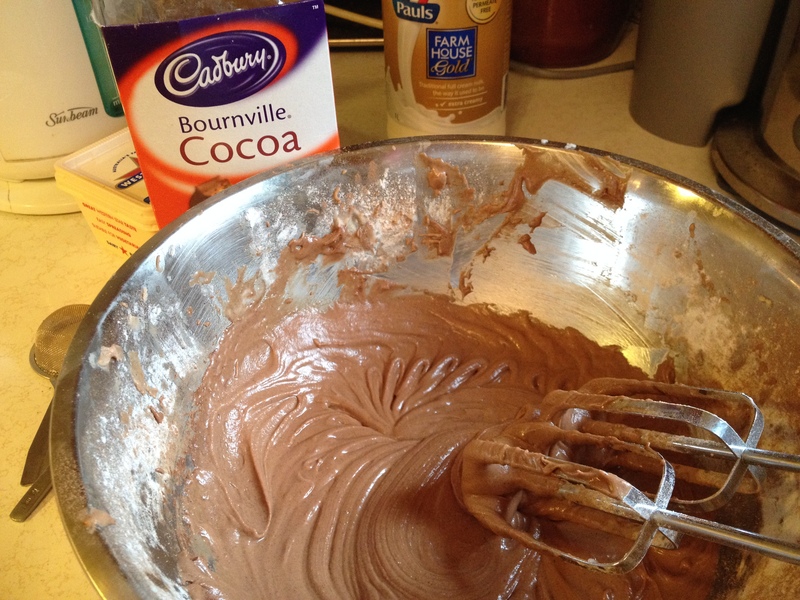 Sift icing sugar and cocoa into a bowl and add softened butter. Beat on low speed to begin, adding a little milk gradually. Then increase speed to medium and beat well, adding more milk if icing is too thick. 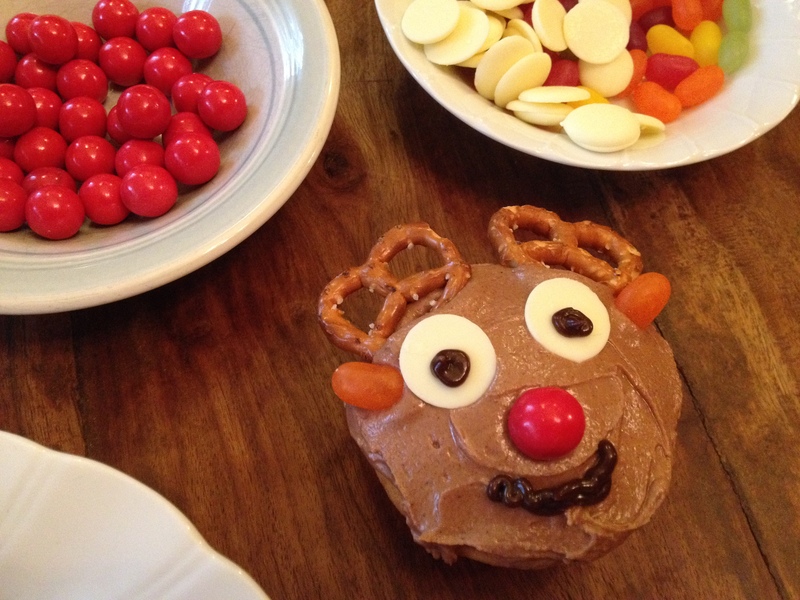 Assemble the cupcakes by spreading with icing, and then decorate to make little reindeer faces. 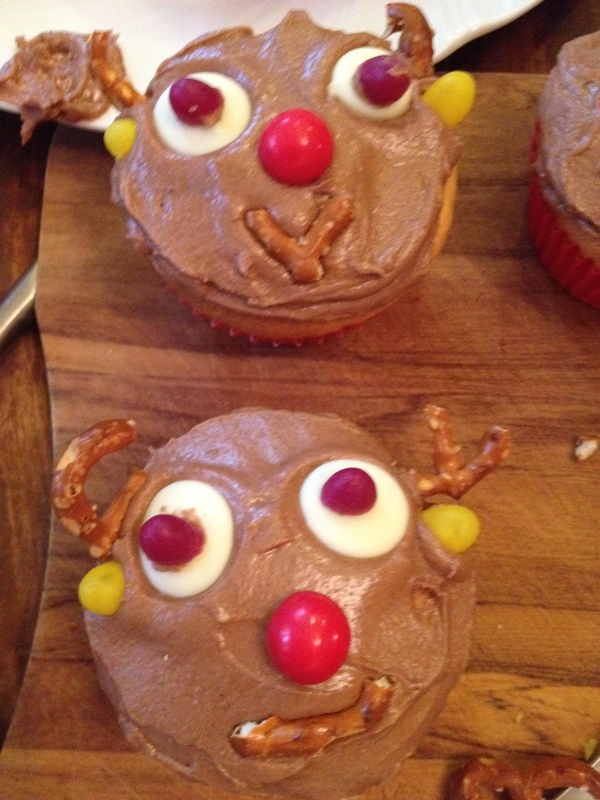 The decorations must be placed onto the icing when it is still wet so that they stick! For a group activity leave arrange the un-iced cakes on a platter, and place the decorations in some small bowls. Provide some butter knives or spoons for spreading the icing and cutting any sweets if needed. 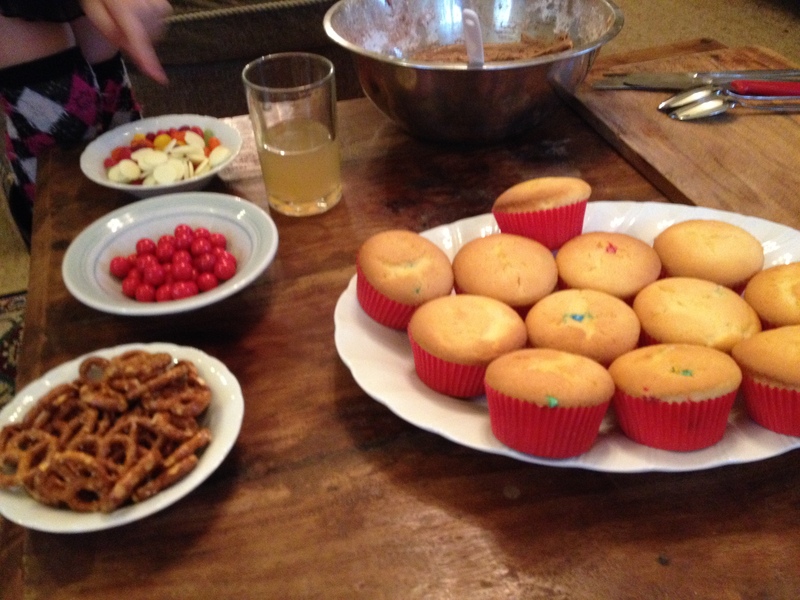 Cupcakes will keep for four days, but are best eaten on the day they are made. They also make lovely party gifts. Who could resist faces like these? 🙂 Happy Holidays! 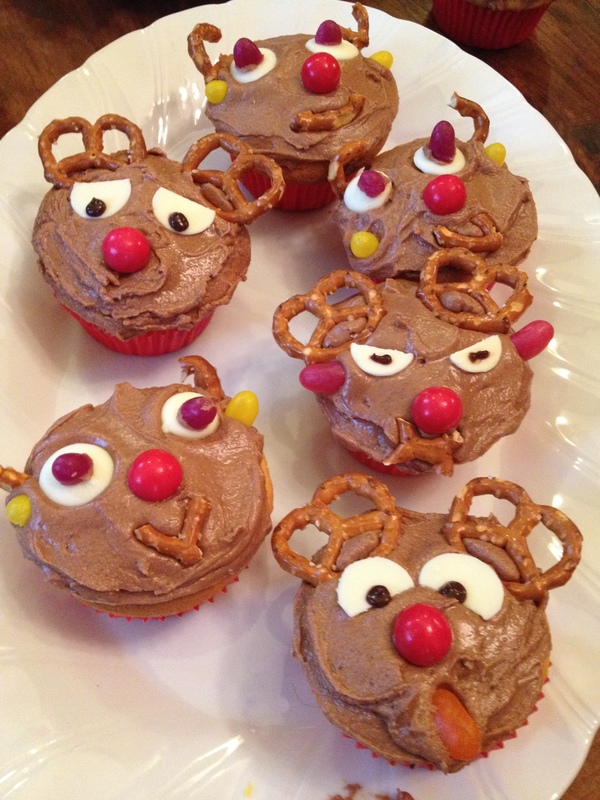 This entry was posted in Cakes and desserts, Christmas and tagged cooking for kids, easy christmas recipes, easy cupcake recipe, family Christmas activity, friendship, kids in the kitchen, recipes for kids, reindeer cupcakes, simple baking, Vanilla Cupcake Recipe by Cauldrons and Cupcakes. Bookmark the permalink. Adorable, Nicole! And slightly evil to eat something so cute 🙂 I’ll start with the antlers, please! Hihihi too cute! Makes me think of the time I made cupcakes with my mom. Aw good memories!